This article is about the canyon neighborhood in Los Angeles, California. For the street, see Laurel Canyon Boulevard. For other uses, see Laurel Canyon (disambiguation). Laurel Canyon is a mountainous neighborhood/canyon located in the Hollywood Hills region of the Santa Monica Mountains, in the Hollywood Hills West district of Los Angeles, California. Laurel Canyon is focused on its central thoroughfare, Laurel Canyon Boulevard. However, unlike other nearby canyon neighborhoods, Laurel Canyon has houses lining one side of the main street most of the way up to Mulholland Drive. There are many side roads that branch off the main canyon, but most are not through streets, reinforcing the self-contained nature of the neighborhood. Some of the main side streets are Mount Olympus, Kirkwood, Wonderland Avenue, Willow Glen, and Lookout Mountain Avenue. The zip code for a portion of the neighborhood is 90046. 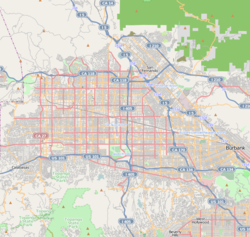 Laurel Canyon Boulevard is an important North-South route between: West Hollywood, Hollywood, and Central Los Angeles; and Studio City and the eastern San Fernando Valley. 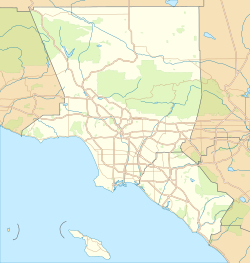 The canyon's division between the two regions is defined by Mulholland Drive. The reliable water supply attracted colonial Spanish ranchers who started grazing sheep on the hillsides in the late 18th and early 19th centuries. After the Mexican–American War and the advent of U.S. statehood for California in 1850, the area was settled by Americans interested in water rights. Until the twentieth century, passage up the canyon was made on foot or by mule. In 1907, an 82-mile dirt road, later named Laurel Canyon Boulevard, was built. It ran up the canyon, dividing at what is now Lookout Mountain Road; the left road went up to the summit of Lookout Mountain, and the other went to the top of the Santa Monica Mountains and then down to the San Fernando Valley. In 1908, the Lookout Mountain Park and Water Co. was formed to purchase 280 acres on Lookout Mountain, just west of Laurel Canyon, subdivided and marketed as mountain vacation properties. On Aug. 14, 1908, the Los Angeles Times announced that the company would build Lookout Mountain Inn at the summit of Lookout Mountain and Sunset Plaza roads, and Lookout Mountain Park, Bungalow Land at Laurel Canyon Boulevard and Lookout Mountain Avenue and Wonderland Park. Two years later, the company widened the winding dirt road to the top of Lookout Mountain where they built the Lookout Mountain Inn. 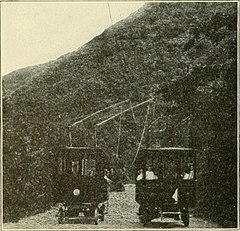 In 1912, Charles Mann, a real estate developer and Richard Shoemaker, an engineer, built a trackless electric trolley bus line which ran between the Laurel Canyon Pacific Electric Shuttle stop at the foot of Laurel Canyon at Sunset Boulevard, The Laurel Canyon Pacific Electric Shuttle ran from the foot of Laurel Canyon at Sunset Boulevard to Gardner Junction at Gardner Street and Sunset Boulevard, Beverly Hills line of the Pacific Electric Railway station. (1451 N Gardner St, West Hollywood, CA 90046  up Laurel Canyon Road from Sunset Boulevard to the Tavern at the base of Lookout Mountain Road, a road house serving visitors. The car had two trolley poles, one to a positive overhead wire and one to a ground overhead wire, and was able to sway to either side of the street, only using power uphill. The trolley was actually a 1912 Oldsmobile with an electric motor and 10-passenger capacity. The overhead wires came down and the service was replaced by Stanley Steamers about 1915. 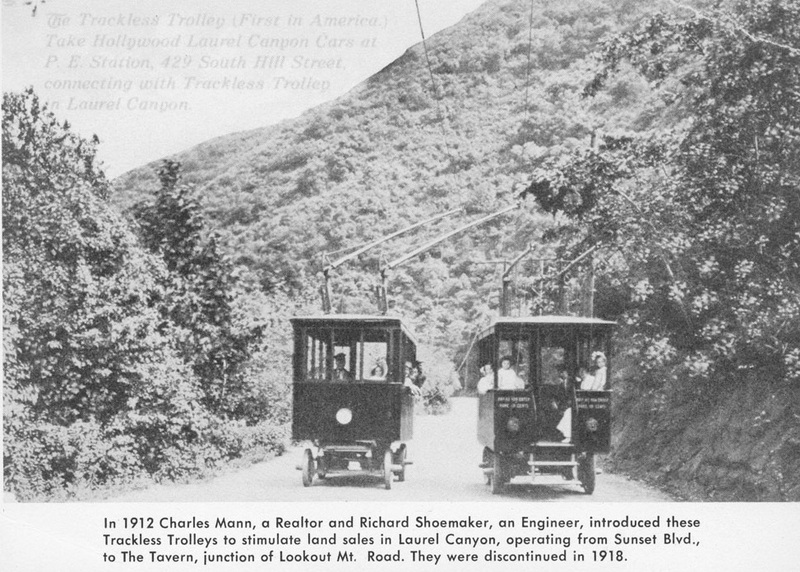 Until 1918, the trackless trolley traveled up and down Laurel Canyon to meet the half hour schedule to Los Angeles. It was insufficiently patronized and discontinued when Pacific Electric stopped running streetcars between Gardner Junction and Laurel Canyon Boulevard, and demand failed to support it. On October 26, 1918, a fire, fanned by strong Santa Ana winds, burned about 200 acres and totally destroyed Lookout Mountain Inn at the summit of Lookout Mountain Avenue and Sunset Plaza Drive. Another major fire occurred in July 1959, destroying some 38 homes. As the roads were improved access was possible by automobile. Now a vacant lot, the corner of Lookout Mountain Avenue and Laurel Canyon Blvd (2401 Laurel Canyon Blvd) is where the Tavern, a famous 1915 "Log Cabin" mansion stood, with its 80-foot living room, floor to ceiling fireplace, bowling alley and indoor sunken swimming pool. It was once occupied by silent film star Tom Mix but spent years on the rental market. In 1968 it was rented by Frank Zappa who turned it into a recording studio and celebrity hangout. However, Zappa moved out after six months. The house burned to the ground on Halloween 1981. Directly across the street, at 2400 Laurel Canyon Blvd., is site of the home, long-gone, that magician Harry Houdini may have rented around 1919. It was originally the Walker estate. Laurel Canyon found itself a nexus of counterculture activity and attitudes in the mid-late 1960s and early 1970s, becoming famous as home to many of L.A.'s rock musicians, such as Frank Zappa; Jim Morrison of The Doors; Carole King; The Byrds; Buffalo Springfield; Canned Heat; John Mayall; members of the band The Eagles; the band Love; Neil Young; and Micky Dolenz & Peter Tork of The Monkees. Tork's home was considered one of Laurel Canyon's biggest party houses with all-night, drug-fueled sleepovers, well attended by the hippest musicians and movie stars of the era. John Phillips of the Mamas & the Papas took inspiration from their home in Laurel Canyon for the song "Twelve Thirty (Young Girls Are Coming to the Canyon), released in 1967. The following year, blues artist John Mayall recorded and released the album Blues from Laurel Canyon based on his experiences during a vacation that he spent in the Canyon. Perhaps most famously, the area and its denizens served as inspiration for Joni Mitchell's third album, Ladies of the Canyon, released in 1970. The house she lived in was immortalized in the Crosby, Stills, and Nash song, "Our House" (1970), written by her then-lover Graham Nash. The group are reputed to have first sung together in Mitchell's living room. Legendary rock photographer Henry Diltz was also a resident and used the scenic Canyon backdrop for many of his historic photos of rock musicians casually socializing. Several of his photos became iconic representations of the 1960s and 1970's West Coast music scene; others became famous album sleeve covers, such as CSN's debut album, Crosby, Stills & Nash (photographed in nearby West Hollywood). Musician Josh Tillman has said that his output under the moniker Father John Misty was partly inspired by a relocation to and personal reinvention in Laurel Canyon. The song "I Went to the Store One Day," from his 2015 album I Love You, Honeybear, recounts the story of how Tillman met his wife, Emma, in the parking lot of the Laurel Canyon Country Store. On July 1, 1981, three members and one associate of the Wonderland Gang, so-called because they were based at 8763 Wonderland Avenue, died in the Wonderland murders (also known as the "Four on the Floor murders" or the "Laurel Canyon murders"). Salon reports: "The massacre took place just down the street from what was then the home of Jerry Brown, who was California’s governor at the time. And 8763 Wonderland Ave. itself is said to have been inhabited at one time by Paul Revere and the Raiders." ^ "ZIP Code™ Lookup - USPS". tools.usps.com. ^ a b "Mary Mallory / Hollywood Heights: Lookout Mountain Inn Promotes Real Estate". 6 October 2014. Retrieved 18 July 2018. ^ https://cdnc.ucr.edu/cgi-bin/cdnc?a=d&d=LAH19100306.2.133.57 Los Angeles Herald, Volume 37, Number 156, 6 March 1910 "Mrs. F. J. Talamantes, accompanied by her daughters, Mrs. M. D. O'Farrell and Miss Fay Talamantes, left yesterday for a two weeks' stay at Bungalow Inn, in Laurel canyon"
^ "Water and Power Associates". waterandpower.org. Retrieved 18 July 2018. ^ "Index of /00018". jpg4.lapl.org. Retrieved 18 July 2018. ^ a b "SkyscraperPage Forum - View Single Post - noirish Los Angeles". forum.skyscraperpage.com. Retrieved 18 July 2018. ^ a b c "CityDig: Looking Back at the Lookout Mountain Inn Los Angeles Magazine". 23 October 2013. Retrieved 18 July 2018. ^ "Laurel Canyon Suite: Gods, Myths, and Fires". 19 April 2017. Retrieved 18 July 2018. ^ "SkyscraperPage Forum - View Single Post - noirish Los Angeles". forum.skyscraperpage.com. Retrieved 18 July 2018. ^ "8626 Skyline Drive - John Bertram in Laurel Canyon". 8 October 2014. Retrieved 18 July 2018. ^ "Laurel Canyon". Pinterest. Retrieved 18 July 2018. ^ "Hollywood Historic Photos". hollywoodhistoricphotos.com. Retrieved 18 July 2018. ^ "Laurel Canyon's Flammable History - Canyon News". 27 August 2010. Retrieved 18 July 2018. ^ a b "Laurel Canyon". 12 October 2016. Retrieved 18 July 2018. ^ "Laurel Canyon Association: 20th Century Canyon History". Web.archive.org. Archived from the original on 2004-06-12. Retrieved 2018-07-18. ^ "Dave McGowan on the Hippie Era and Stranger than Fiction Laurel Canyon Rock Scene - FarOutRadio.com". faroutradio.com. Retrieved 18 July 2018. ^ "8917 Appian Way - Spanish Home in Sunset Strip West". 21 January 2015. Retrieved 18 July 2018. ^ "Laurel Canyon Neighborhood Posts - Brian Ades Legacies of L.A." Brian Ades Legacies of L.A. Retrieved 18 July 2018. ^ Brown, August (2 August 2007). "Where the rockers let their hair down". Retrieved 18 July 2018 – via LA Times. ^ Dowd, Vincent (28 September 2011). "Frank Zappa: the clean-living hellraiser". BBC News. Retrieved 6 September 2014. Interview with Pauline Butcher, Zappa's live-in secretary. ^ "The Rock and Roll Treehouse". www.jackboulware.com. Retrieved 18 July 2018. ^ "Inside the Laurel Canyon Houdini Estate". www.wildabouthoudini.com. Retrieved 18 July 2018. ^ "Laurel Canyon Part 4". 4 January 2010. Retrieved 18 July 2018. ^ "The GTO's in Laurel Canyon". Velvet Burnout. Retrieved 18 July 2018. ^ "Joni Mitchell's House is a Very, Very, Very, Fine House". Stargayzing.com. Retrieved 18 July 2018. ^ Sheila Weller, Girls Like Us: Carole King, Joni Mitchell, Carly Simon—And the Journey of a Generation, Atria Books, 2008, ISBN 0743491475. ^ Weiner, Jonah (19 February 2015). "The Gospel of Father John Misty". Rolling Stone. Retrieved 18 July 2018. ^ Fennessey, Sean (6 February 2015). "The Third Revelation of Father John Misty". Grantland. Retrieved 18 July 2018. ^ Lemons, Stephen (June 9, 2000). "Return to Wonderland". Salon. Michael Walker, Laurel Canyon: The Inside Story of Rock ’n’ Roll’s Legendary Neighborhood, Farrar Straus and Giroux (16 May 2006), hardcover, 277 pages, ISBN 0-571-21149-6 trade paperback (May 1, 2007); ISBN 0-86547-966-6. Harvey Kubernik, Scott Calamar, Diltz, Henry, Lou Adler, Canyon of Dreams: The Magic and the Music of Laurel Canyon (Sterling Publishing, 2009), 384 pages, ISBN 978-1-4027-6589-6. Excerpts available at Google Books.